But she's laughing at my awesome hair! Reason: I've always felt Constantine needed a good shampoo. Because there's only one seat. Or... sit in my lap. "Very Funny! Santa Claus did NOT bring this in your stocking!" 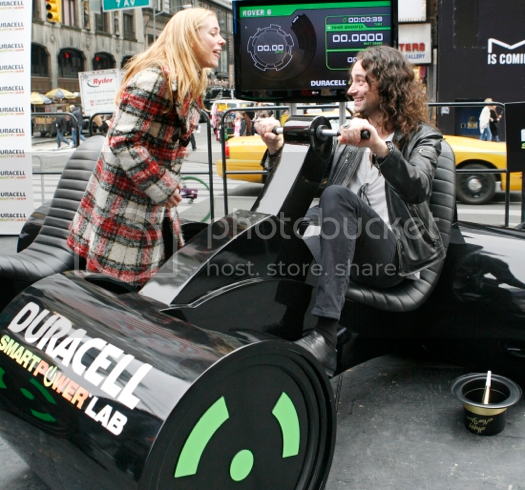 Constantine Maroulis: (delivering his latest pick-up line to Kerry Butler) May I drive you crazy??? Two old flames getting reaquainted. Mario always knew Peach was a Kart kind of girl. P.S. Is that Constantine Morales from American Idol? Yes, I'm a nerd. Oh--just saw that SparkleFarkle agrees!! It's Constantine's grown-up Big Wheel - showing it off to his best girlfriend.